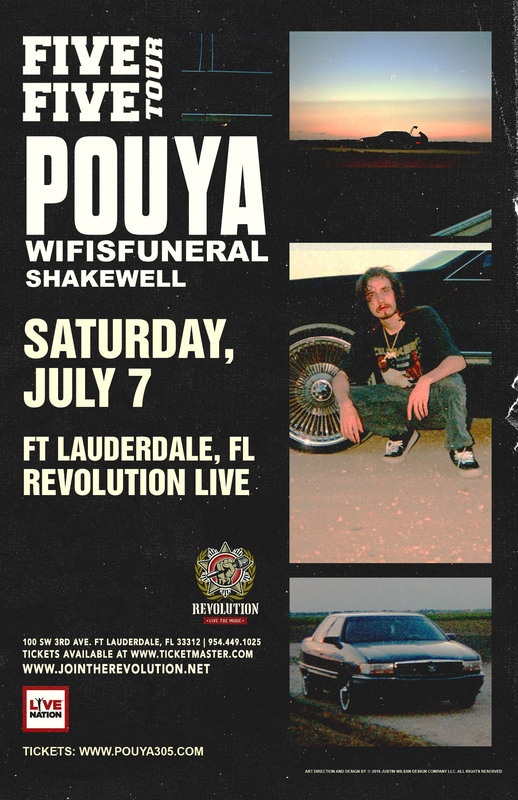 Pouya came to prominence with fellow South Florida rapper Robb Bank$ in 2013. He goes by the nickname Baby Bone as a reference to his influence, Bone Thugs-n-Harmony. Pouya has dropped four mixtapes and released his debut full-length album Underground Underdog in late April 2016 and reached #2 on the iTunes Top Hip Hop Albums. Pouya has collaborated with other artists including Fat Nick, Getter, and $uicideboy$. Pouya’s album FIVE FIVE received New Music Friday support from Spotify, and peaked at #2 on the iTunes Hip Hop charts and #7 Overall. ​The 11-track journey through his lifelong struggle with anxiety and depression, down-south turn-up and money metaphors has racked up over 20 million streams collectively across digital platforms in the short month since it’s release.